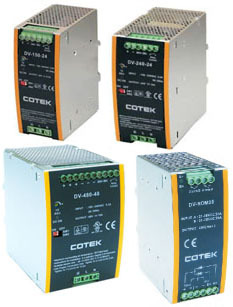 The Cotek Series DV are DIN rail mount single-output power supplies available in power ratings of 150W, 240W and 480W, offering efficiency levels of 87~92%. Compared to Cotek Series DN, Series DV have higher wattage, plus feature enhancements such as 150% peak load capability, selectable peak load mode, convection cooling and built-in Remote ON/OFF and DC OK functions. Redundancy for the 24V models can be obtained using the Cotek Model DV-RDM20 20A Redundancy Module.